1) Where did the life rafts go? Why was there only one life raft when passengers were told repeatedly that there was to be five? 2) Why did the engines quit? 3) Why was the U.S. Army so silent about the incident? And why did passengers get so little press exposure and social treatment as might be expected from such a tragedy? Where did the life rafts go? Only one life raft seemed to be available for survivors. Fifty one of 76 persons were rescued and all of them were in the same single 25-person life raft. Three died before the trip ended. Everyone was told that there were five life rafts: one inside the cabin and two in storage bays on each wing. Everyone was instructed on how to board the rafts that came out of each wing. In the end, only two rafts were recovered. The Swiss ship Celerena intercepted the one overcrowded raft with its cargo of 51, and the second raft by a voluntary search vessel that quickly turned it over to the Canadian carrier Bonaventure. This leaves three life rafts unaccounted for. Two life rafts were assumed to be lost when the left wing was sheared off on impact. The life rafts stored in the both wings were to eject and inflate automatically on impact. We were told that repeatedly during the preparation drills. Why didn’t they inflate on impact when the wing sheared off? It was automatic. What about the other two stored in the right wing? One was found by a now deceased Flying Tiger 923 crew member, a woman, who was able to get on board. That one life raft was retrieved by a search vessel and that lone passenger was found dead on arrival. What about the other? It seems to me that they did very little research into the matter. And they glossed over the matter very quickly. Air Force Major Harry Benson, who was a passenger and survivor, was very familiar with the aircraft. He had piloted the same model aircraft while on active duty. He told other reputable passengers that he set his eye on the life raft bay closest to the passenger cabin prior to impact. His plan was get out of the aircraft immediately after impact so he would go directly to the storage bay to release the life raft himself. He would then help others to board the raft. Major Benson was “almost“ able to execute maneuver as planned, except for one problem. When he got out on the wing and opened the raft bay, the bay was empty. No life raft there! The other raft assumed to be on the same wing apparently opened and blew off in the wind away from the panicked passengers. Somehow a stewardess found her way into that raft and she died before a chance for rescue. As said in the beginning of this story, everyone aboard Flying Tiger 923 expected five life rafts to be waiting for them. Of course, in the chaos created by impact, the number of rafts was of little importance as long as there was one available for boarding. While survivors were thrilled to be alive, there were a few serious rubs with the issue of one raft. Air Force Capt. Juan Figueroa, MD, called for his wife as he desperately clung to the outside of the slippery raft. She was still inside and alive. Her shouts seemed to be coming from what seemed to be a distance. Dr Figueroa shouted back to he to assure her he was OK and told her that he was getting on “another” raft. He did not see her or hear her again, even though they were not more than a few feet apart. He was certain they were in different rafts over crowded rafts.. Soon after the rescue by the Celerina crew, and all survivors were accounted for, his wife sent him a note by way of a ship’s crew member telling him that she was saved and nearby. Dr. Figueroa was having mixed thoughts about the lifeboat situation. He asked a question of the message bearer before he left the cabin. Dr. Figueroa asked, “how many rafts made it to the rescue”? The answer he got was “one.” No other words. And there he learned how close he was to his wife, but yet they were so far apart. They never saw one and other or heard each others voice during the entire six hour ordeal. Can you imagine the shock Major Benson must have had when he discovered that the life raft bay on the wing was empty? And incidentally, there was no evidence that ever was anything in there. In the end, survivors were all happy that they were among those “miraculously” saved. One raft was all that was they needed for their salvation. There were so many things to be happy about. 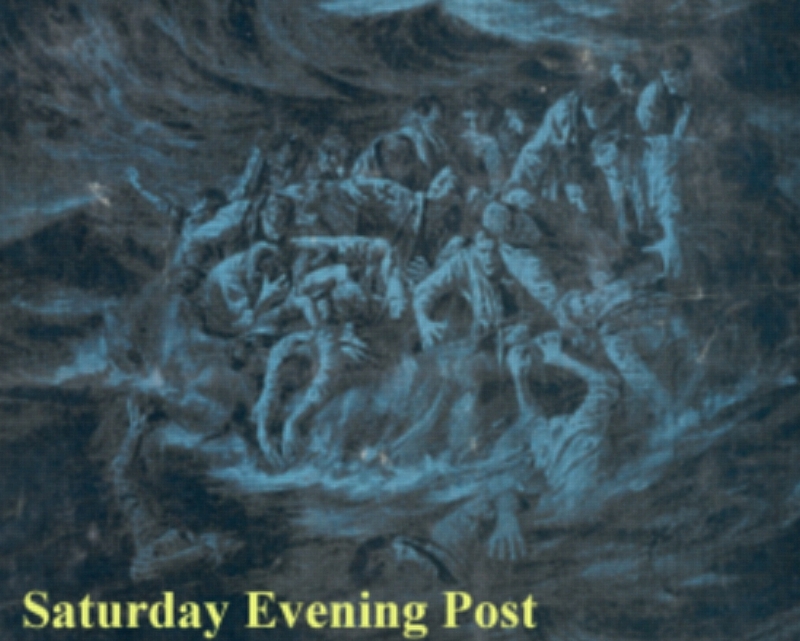 The image below was given nearly a full page in a story about the crash and rescue that appeared in The Saturday Evening Post in late 1962. 51 people packed in a raft for 25. This entry was posted in flight crew, new combat troopers, passengers, rescue teams and tagged air crash, air disaster, Flying Tiger 923, liferaft. Bookmark the permalink. 3 Responses to Where did all of the life rafts go? There were supposed to be five. Right? “The life rafts stored in the both wings were to eject and inflate automatically on impact. We were told that repeatedly during the preparation drills. Why didn’t they inflate on impact when the wing sheared off? It was automatic.” The answer is simple: The statement made by the crewmember was erroneous! I have a complete L-1049H Operations Manual issued in 1966 by Flying Tiger Air Services (a subsidiary of the Flying Tiger Line), which was basically a copy of the Flying Tiger Line manual. The manual reads, “There are four wing rafts, two in the left wing and two in the right. The wing rafts are released by pulling a ‘T’ handle which is in the aft side of the window frame of the aft emergency exit over the wing. The ‘T’ handle is connected to both the inboard and outboard rafts on that side of the aircraft and when it is pulled out approximately 12 inches, it releases the locking pins on both the bin doors and opens the CO2 valve on the rafts.” I flew and worked on Super Constellation N6922C, which was a sister ship of the ditched aircraft, N6923C. I remember the T-handle. Exact reference is: Emergency Procedures/Ditching on Water/Launching Life Rafts, found on page 1.11.5.